Our joint-practice clinic was established in 1968 by Dr. med. Ali Akbar Djamchidi. Ever since, we have been offering a comprehensive range of both surgical and conservative therapies for diseases of the ear, nose and throat, as well as cosmetic-surgery procedures. Our palette of cross-disciplinary medical services was eventually expanded to include dental medicine and implantology. Our various specialists work hand in hand. Outpatient procedures are performed on the premises of the Praxisclinic Berlin Corneliusstrasse, while inpatient operations are performed in the facilities of the DRK-Kliniken Berlin Westend. 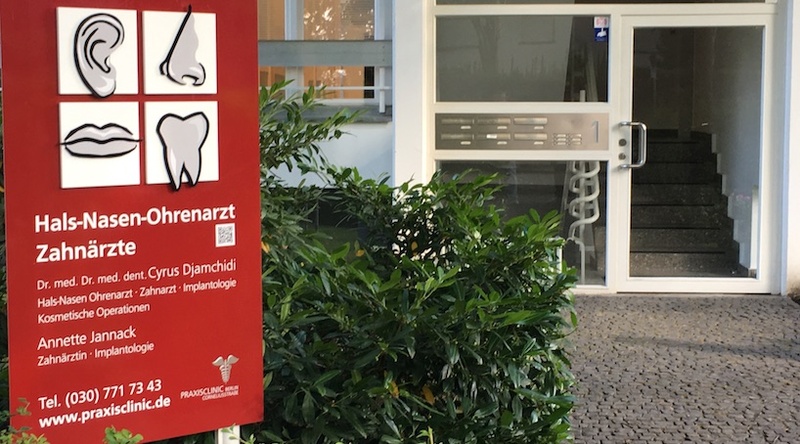 The Praxisclinic Corneliusstrasse Berlin is situated in a quiet, leafy neighborhood in the Berlin district of Steglitz, close to the S-Bahnhof Lankwitz light-rail station (5 minutes on foot). to the Praxisclinic Berlin Corneliusstrasse, a joint-practice clinic with a long track record of professional experience and top-of-the-line healthcare services. Our friendly and qualified team will be happy to look after your individual needs. Or take Bus No.186 or 283 to Mozartstrasse. Our clinic is just a five-minute walk from either station/bus stop.